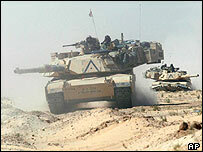 All the signs are that US troops have been ordered to press on with their rapid advance on Baghdad. Does stiff resistance lie ahead for US forces? But despite some local counter-attacks, the level of Iraqi resistance has been puzzling. Is the Republican Guard a phantom army? Has its armour and artillery been destroyed from the air? Or have its forces simply melted away in the face of the US advance to take up new positions closer to Baghdad? There is no doubt that the pace and scale of the US thrust on the Iraqi capital has been remarkable. This movement will be studied in the staff colleges for many years to come, was the comment of one senior British commander here in Qatar. Key objectives have already been identified on the routes into Baghdad, and these could well be in US hands within the next couple of days if the current rate of progress continues. But for all the precision and choreographed logistical support, there is one great mystery - where have the Iraqi formations gone? US commanders are not dropping their guard. As forces converge on the Iraqi capital, they are fearful that they could come under chemical attack. There is also a wariness about the possibility of US units being drawn into a trap. There is some evidence from intelligence reports of certain Republican Guard units moving into the outskirts of the capital. Military spokesmen here say that the Americans have no intention of fighting street to street. We will not turn Baghdad into Grozny, was the way one source put it; a reference to the Chechen capital, largely levelled by Russian forces. But it is clear that the fighting over the next few days could be just a preliminary to a lengthy stand-off, where the internal dynamics of the Iraqi regime will be just as important as military factors on the ground.